The day after tomorrow is a most special day for Chinese people. It marks the start of Chinese New Year, also known as the Spring Festival. This year, to my great delight, I have been invited by the Welsh First Minister, Carwyn Jones, to come and join the Chinese New Year celebrations in Wales. This invitation and these Chinese celebrations show that the Welsh government attaches great importance to relations with China. Since I arrived in London three years ago, I have visited Wales five times. Each time here I felt very much at home! This is not only because of the beautiful nature and hospitable people, but also because we share the icon of the dragon! There is clearly a lot in common in our national characters and cultures. The outgoing ‘Year of the Dragon’ is of special significance to China for several reasons. The Chinese economy achieved growth while maintaining stability. In addition, the quality of Chinese people’s life continued to improve. This progress will continue as China follows the blueprint drawn up late last year at the 18th National Congress of the Communist Party of China. This Congress elected a new leadership for China, which will have the responsibility of implementing the ‘blueprint’ for China’s future development and set out the goals of building China. In China we describe the aims as creating a well-off society and deepening reform and opening up. China is getting close to what is being described as the ‘China Dream’ of revitalising the Chinese nation. The ‘Year of the Dragon’ also marked the 40th anniversary of full diplomatic relations between China and UK. Over the past four decades, China-UK relations have advanced steadily. Our cooperation in economy, science and technology, education, culture and tourism has been fruitful. China and UK are two major countries of global influence; this means that a sound China-UK relationship not only benefits our two peoples but also contributes to world peace and prosperity. Last year Britain was the only EU member that saw growth in both imports from and exports to China. Chinese investment in Britain expanded at a rate never seen before. China and UK launched the high-level people-people dialogue; this reflects how China and UK now place even greater importance on exchanges and cooperation in education and culture. The experience of China-UK relations in the past 40 years shows that only when we respect each other and treat each other as equals can our relations keep moving forward. In turn respect leads to cooperation broadening and friendship between our peoples deepening. Cooperation between China and Wales has advanced in many positive ways in recent years. 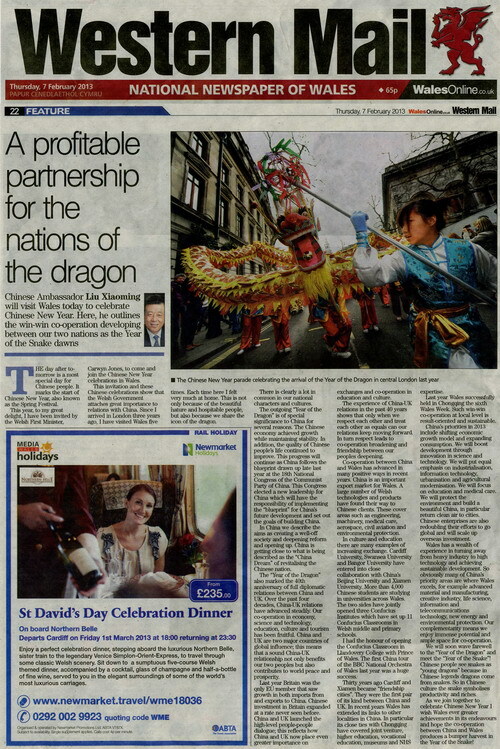 China is an important export market for Wales. A large number of Welsh technologies and products have found their way to Chinese clients. These cover areas such as engineering, machinery, medical care, aerospace, civil aviation and environmental protection. In culture and education there are many examples of increasing exchange. Cardiff University, Swansea University and Bangor University have entered into close collaboration with China’s Beijing University and Xiamen University. More than 4000 Chinese students are studying in universities across Wales. The two sides have jointly opened three Confucius Institutes, which have set up 11 Confucius Classrooms in Welsh middle and primary schools. I had the honour of opening the Confucius Classroom in Llandrovery College with Prince of Wales. The first China tour of the BBC National Orchestra of Wales last year was a huge success. Thirty years ago Cardiff and Xiamen became ‘friendship cities’. They were the first pair of its kind between China and UK. In recent years Wales has extended its links to other localities in China. In particular its close ties with Chongqing have covered joint venture, higher education, vocational education, museums and NHS expertise. Last year Wales successfully held in Chongqing the 6th Wales Week. Such win-win cooperation at local level is result-oriented and sustainable. Wales has a wealth of experience in turning away from heavy industry to high technology and achieving sustainable development. So obviously many of China’s priority areas are where Wales excels, for example advanced material and manufacturing, creative industry, life science, information and telecommunications technology, new energy and environmental protection. Our complementarity means we enjoy immense potential and ample space for cooperation. We will soon wave farewell to the ‘Year of the Dragon’ and meet the “Year of the Snake! Chinese people see snakes as ‘young dragons’ because in Chinese legends dragons come from snakes. So in Chinese culture the snake symbolizes productivity and riches. As we join together to celebrate Chinese New Year I wish Wales ever greater achievements in its endeavors and hope the cooperation between China and Wales produces a bumper harvest in the year of the Snake!